Version 1.01 - added Vegetable Oil [50 Kernels] to the oil press. Version 1.02 - fixed a couple of minor errors found by Paeng. 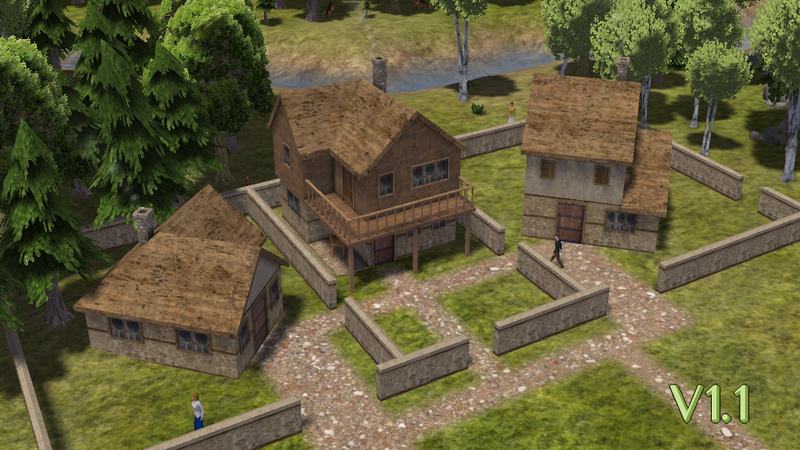 Version 1.1 - Added a couple of houses (two angled) and some wall pieces. It was a good teamwork. The sunflower is under my deco button on my toolbar. Oh, thank you so much for the sunflower, @kid1293 that is so nice. It was fun to help, the set is wonderful. Good job. Had to have a look. What a fun little mod! Already know what I'm going to do with it. Congrats @kid1293 that looks sweet. Nice to see you here @QueryEverything and thank you. Much of the impression is that nice texture and I wanted to really use it. It fits these production buildings but, I guess, would be too much on a town house set. @I did test using vanilla crop field and orchards. If you make them the same size as one of the greenhouse covers, it works just fine the only problem is you can not click on the field or orchard to get the statistics without removing the cover, and of course the production numbers are lower than a normal size field. The cabbage and peach trees looked really nice. If you make the field smaller you can put other ghosted items inside also or on the field itself, I did not try but I would think a storage crate and well and other small items would also work, it could actually be purely deco, there are many fun possibilities. I even had a deer wander in the sunflower nursery, grazed a little and turned around and went back out, precious. The new crops that @RedKetchup made are wonderful and thus so are the deco veggies @kid1293 made for this set, great combination. Thank you Red and Kid for nice additions to our game. @kid1293 well, now you did it , what about a rooftop greenhouse? I know, not possible, everything would have to be raised to that level. But is would be cool , but too modern. Oh well. 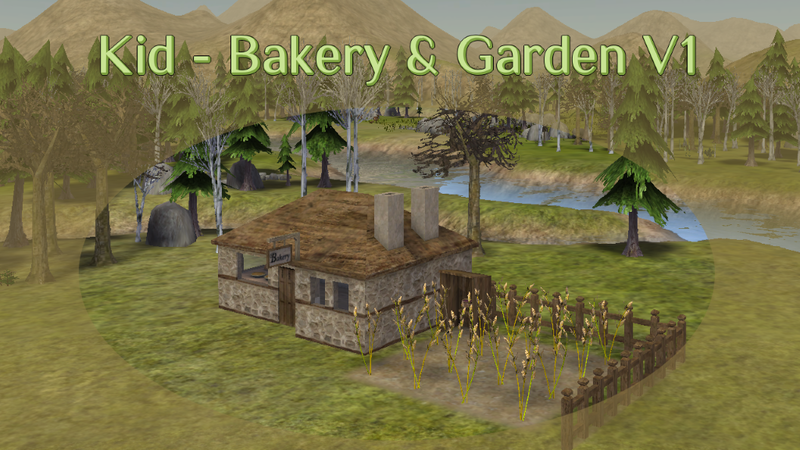 So I have a story in mind for those Stone House addons, and a town name in mind for the Bakery & Garden, eager to do them but I have another town I must do first. So many great new mods to try. Love the stone wall texture on these, very authentic looking. And I can see pies in the bakery window ! Can't wait to play with these shiny new toys... pumpkin pie, mmmmmm. @Abandoned - - - Rooftop greenhouse? Great idea, but I don't know if it is possible. In order to make bannies walk up there it can't be ghosted. Well it can, but then you can't have anything under it. I see one solution but only on second floor. I think I pass on that one. something to stuff into it. Everything is in the mod, you'll find it. edit, picture a little blurry, I tried to enlarge. @kid1293 Absolutely love this set and it fits perfectly with something I've been wanting to do for quite some time and have decided to table what I had been working on to give it a play. Already have had some ideas for things I'd like to do with it in the future. Quick question, though....I've been doing some testing to get a feel for how I'm going to approach it. Generally with food and food production buildings I'll make some things and see how they sort out in specialized markets to see what food groups they covered. Noticed that the raw foods from this set don't go anywhere but in general food markets. Using Market Puzzle, it seems to break down to all of it going to the general food market, Seed Oil to protein, Spices to Fruit and Vegetables, and Barley, Flour, Pumpkin Pie, and Fruit Pie goes to Grain. So, are the raw foods just for production and don't represent any particular food group? Are the pies grain only? No, everything is flagged 'edible' (except flour) and should go to general market. Aye, and they are. I'm trying to sort out food groups. Are the pies fruit and grain or just grain? I think I may have had something off in my load order because nothing was going to the specialized markets, just the general food, but now seem to be going to the right places. I need to have another look though.